The Dental Assistant Program offers both a two-year Associate of Applied Science Degree and a one-year Certificate of Achievement. Completion of either program qualifies students to take the Michigan state board exam and, after passing the exam, students may practice as Registered Dental Assistants. Program completers are also eligible to take the National Certification exam which is recognized nationwide. A dental assistant is a member of a highly-qualified health team who has varied duties and flexible hours. While most dental assistants work as chairside or business assistants, other career paths include lab technicians, insurance consulting, dental supply sales, and instructors. Nationally, employment of dental assistants is expected to grow by 15 percent from 2016 to 2026, much faster than the average for all occupations. Employment of dental assistants in Michigan is expected to increase much faster than the average for all occupations through the year 2024. 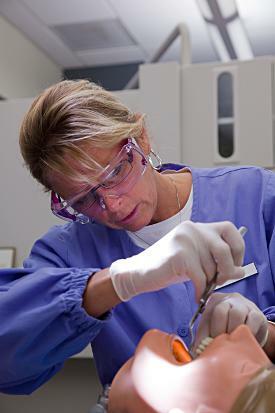 An average of 270 openings for dental assistants is expected annually. Nationally, the median annual salary in 2017 was $37,630 for dental assistants. Please contact the Dental Assistant Program Director for complete information. “I was very pleased with the Dental Assistant program at NMC. It definitely exceeded my expectations! The instructors are both wonderful and are very willing & happy to help their students succeed during the program and even after graduation. I'm very happy with my career choice and am thankful to have went through such a great program!"